Justin and Lenora Hunter are completing a full year of traveling around the world with their two sons. 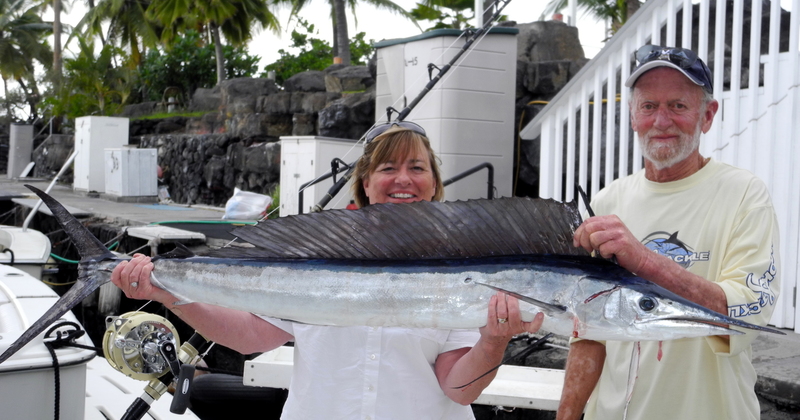 Fishing in Kona Hawaii is one of their last trips before heading to Alaska. 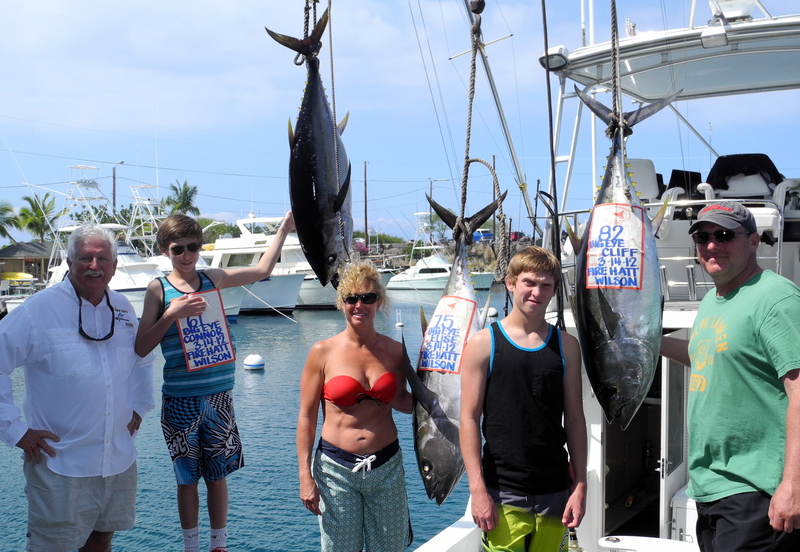 9 year old Aidan and 12 year old Zach are experiencing opportunities of a life time while getting to fish in places like South Africa and various other destinations in the South Pacific. Having caught some impressive fish along the way, they could only dream about hooking a Pacific Blue Marlin. They Did! We left the harbor at 7:00 am for a 3/4 day charter and headed South towards Captain Cook. They enjoyed a beautiful snorkel in the bay and anxiously got back to the boat to continue the quest. So far we did not even get a bite. The boys are begining to look at Me and Adam and Mom and Dad giving the “Where’s the fish?” look. No pressure there… On our way back up the line just after noon, the long rigger line is bit and line is screaming! The Ice Blue Lucky Linda Lure comes through for us again, we are Hooked Up! 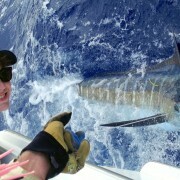 It is a Blue Marlin and 9 year old Aidan is in the chair. With lines cleared and Adam at his side, the battle begins. I was so amazed at the tenacity of this young man! He fought sooo hard. After about fifteen minutes Aidan gave his older brother Zach an opportunity in the chair. Knowing this was Aidan’s fish, Zach lets Aidan back in the chair to finish the fight. This fish was to the boat quickly, we had it to leader two times and had to let go. 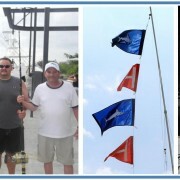 On the third try we were able to successfully get the hook out and release a nice healthy fiesty Pacific Blue Marlin. We estimated Aidan’s fish to be about 400 pounds. This crushes the family record Marlin held by Aidan’s Grandfather, a 300+ pounder. I think the bar has been set quite high for Zach now! 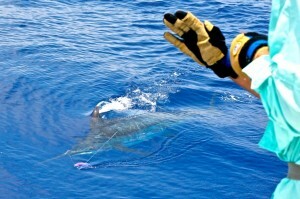 Featured in photo above is Adam Ludwig with Aidan’s Pacific Blue Marlin to leader wearing AFTCO Release Gloves. The Lucky Linda Lure is by Bomboy Lures.